HamiltonForward has learned of a huge new development planned in Stoney Creek after new applications were published to the City of Hamilton’s online Development Mapping service. The City has received both a Development Application (no. DA-19-020) and Site Plan Application (no. SPA-19-020) for the lands at 310 Frances Ave, in Stoney Creek. The plans call for three towers, the shortest at 48 storeys, the middle at 54 storeys, and the tallest at 59 storeys. If built, these towers would become the 3rd, 2nd, and 1st tallest towers in the City, respectively. Rendering of 310 Frances Ave. Adding to the intrigue of this project, it was revealed that appropriate zoning is already in place and these towers would not require a rezoning application. By-law No. 10-027, which covers this site, set no maximum density, no maximum height, no maximum lot coverage, and no maximum number of buildings on the land. Also of note in the By-law is the minimum residential density, which is set at 585 units. This gives us the indication that City wanted and was expecting an intense density on the site. 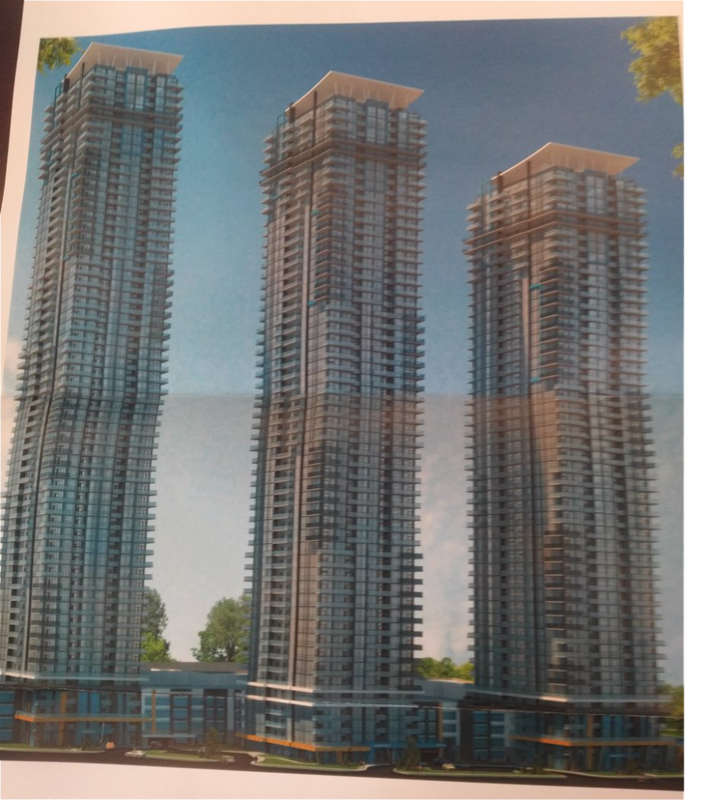 For comparison, the Television City proposal in the downtown only contains 360 units, and comes in at a height of 40 and 30 storeys respectively. At 1,836 units, the proposal is also one of the largest in the City based on density, and would add a considerable number of new residents to the area if built. Unfortunately, the City of Hamilton does not post development application documents online, so we are still dealing with a limited amount of information regarding this project. The developer behind this project is likely New Horizon Development Group, as they have worked on multiple nearby projects, and have used this land for a condominium sales centre in the past. Response to the proposal has been mixed. Some local residents have expressed concern over the proposed density, heights and lack of infrastructure. Some members of the local SkyscraperPage forum have declared support for the proposal, while some have expressed preference for developments like this to take place in the Downtown rather than our suburbs. As well, some have indicated that this project could be a good tool for arguing against the Escarpment height limit in the Downtown Secondary Plan and Tall Building Guidelines. Regardless, with the zoning in place for this project, the City is essentially required to issue a Site Plan permit, so long as the project documents conform with all regulations. We’ll continue to watch this file as it makes it’s way forward, and keep your informed on the status of this project. Thanks to one of our followers on Twitter, we’re able to share some more information about this proposal. Firstly, we can confirm the developer behind the project is New Horizon Development Group. Secondly, we can confirm that the proposal is planned to be built in three phases, Phase 1 being the tallest tower (Tower 1), Phase 2 being the middle tower (Tower 2), and Phase 3 being the shortest tower (Tower 3). As well, we now know specifics on unit numbers. Tower 1 will contain 670 units in total, comprised of 448 one-bedroom units and 222 two-bedroom units; Tower 2 will contain 615 units in total, consisting of 410 one-bedroom units and 205 two-bedroom units; and Tower 3 will contain 551 units, comprised of 367 one-bedroom units, 182 two-bedroom units, and 8 three-bedroom units. Combined, the development will contain 1,225 one-bedroom units, 609 two-bedroom units, and 8 three-bedroom units, which roughly translates to 66.7% one-bedrooms, 33.1% two-bedrooms, and 0.43% three-bedrooms. We have also obtained a breakdown of parking. The proposal contains a total of 2,409 parking spots, of which 2,040 are reserved for tenant use, 347 are reserved for visitor use, with the remaining 22 dedicated to commercial use. Ultimately, the parking spaces in this project will span 6 floors, with 2 underground parking levels, and 4 above-grade parking levels. On the ground floor, 357 visitor parking spaces will be inside the development, 5 visitor parking spaces outside the development, and the 22 commercial spaces also outside the development. This is crazy to put this amount of building in this area. First you’d need to expand the north service road to four lanes from two from at least Millen Rd. to Centennial Pkwy. Some how find a way to increase width of Frances Rd. as well unless you want to see lots of fatal accidents involving pedestrians. (I know of some BLIND & PHYSICALLY IMPAIRED who walk along Frances Rd and rely on the DRIVER BEING CAREFUL.) The closest public transit is over 2 km away and to get to it you have to walk along Grays Rd. which has NO SIDEWALKS!!!!! Then where are the guests of these people going to park???? They can’t park on the streets. There’s already NO ROOM. Oh I guess if you got special permission you could tear down the fence along the Q.E. and have guess parking along the shoulder of the Q.E. There wouldn’t any room along the service road as that presently is too narrow. Also you’d have to guarantee there won’t be any flooding near any of the homes near any of the creeks because of there’s less land to absorb runoff. Other cities do it to prevent flooding. Guess Hamilton only cares about $$$ If there is flooding who ever owns the building/land when its done I know will never hear the end of it from many from the neighbourhood. Plus it will just add to the traffic congestion. Oh sure a GO station is going to be near by but how long will it take to get to it when lots of others use that north service road not just locals. Don’t forget if there’s an accident on the QE or during rush hours lots of drivers use the north service road. Also the city still allows trucks to use this side of as well. Traffic can be backed up at Drakes and the service road all the way along the bridge in the mornings during the week. Just imagine what Green rd will be like with 2000 cars leaving and that’s only from those 3 builds during rush hour. Ya traffic jam in the parking lot. Not everyone works from home or different hours. In closing at the height you’re planning they’re not going to add anything to the community except maybe some ugliness!! If this goes through and there’s a serious accident because of the high density developments of this area it will tarnish what was once a beautiful area area to live in. ! Build them. Maybe 25 storeys max. Do you consider the movie “Skyscraper” as action or horror?